i. मनोहरबाट सामान खरीद [Purchased goods from Manohar] Rs. 50,000.
ii. 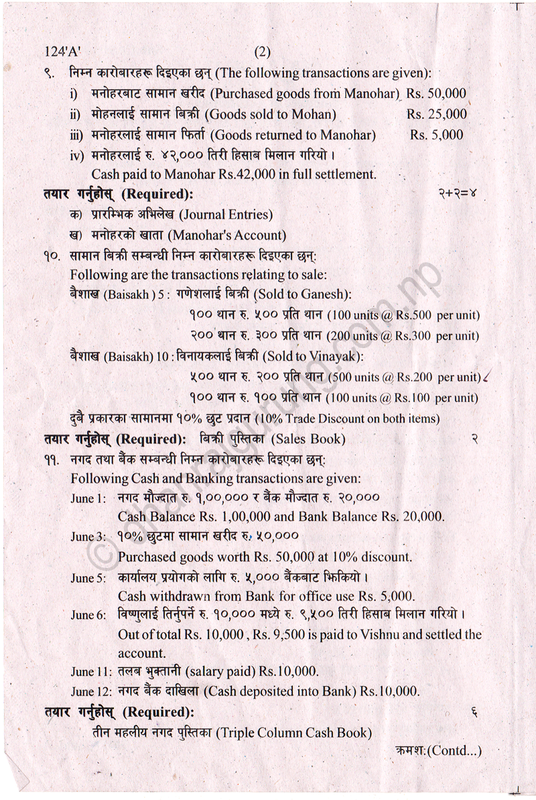 मोहनलाई सामान विक्री [Goods sold to Mohan] Rs. 25,000.
iii. मनोहरलाई सामान फिर्ता [Goods returned to Manohar] Rs. 5,000. June 11 : तलब भुक्तानी [Salary paid] Rs. 10,000. June 12 : नगद बैंक दाखिला [Cash deposited into Bank] Rs. 10,000.
iv. रु. ३,००० को चेक बैंकमा जम्मा गर्न पठाएको तर बैंकले पास बुकमा क्रेडिट नगरेको। [A cheque of Rs. 3,000 was sent for deposit into Bank but not credited in Pass Book. ii) मेसिनको ह्रास खर्च रु. १,००० गल्तीले रु. १०,००० लेखिएछ। [Depreciation of Rs. 1,000 on machine wrongly entered as Rs. 10,000.
i) तिर्न बाँकी खर्च [Outstanding expenses] Rs. 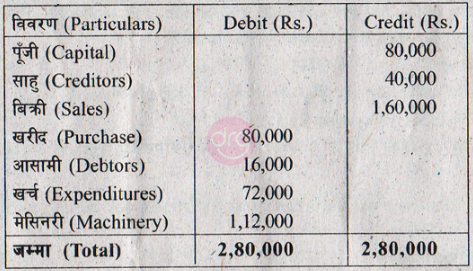 5,000.
ii) मेसिनरिमा १०% ले ह्रास कट्टी गर्ने [Depreciate machinery at 10%]. ii) मेसिनरीमा १०% ले ह्रास कट्टी [Depreciate machinery at 10%]. iv) तिर्न बाँकी ज्याला [Outstanding wages] Rs. 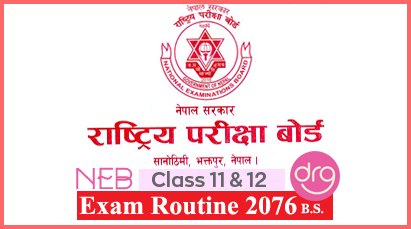 2,000.
v) अग्रिम तलब भुक्तानी [Prepaid salaries] Rs. 10,000. १६. एउटा कम्पनीले बैशाख १, २०७० मा दुई वटा मेसिन, प्रति मेसिन रु. २,००,००० का दरले खरीद गर्यो। माघ १, २०७१ मा रु. ३,००,००० को अर्को मेसिन खरीद गर्यो। २०७० मा खरीद गरेको एउटा मेसिनलाई २०७२ कार्तिक १ मा रु. १,५०,००० मा विक्री गर्यो। कम्पनीको खाताहरु चैत्र ३१ मा बन्द गरिन्छ। मेसिनमा वार्षिक १०% का दरले घट्दो शेष प्रणाली अनुसार ह्रास कट्टी गरिन्छ। [On 1st Baishakh, 2070 a company purchased two machineries @Rs. 2,00,000 each. On Magh 1, 2071 another machine was purchased for Rs. 3,00,000. On Kartik, 2072 the company sold one machine purchased on 2070 for Rs. 1,50,000. The accounts of the company are closed at the end of Chaitra each year and depreciation is charged 10% p.a. on diminishing balance method. मेसिन खाता २०७० देखि २०७२ सम्म [Machine Account from 2070 to 2072]. 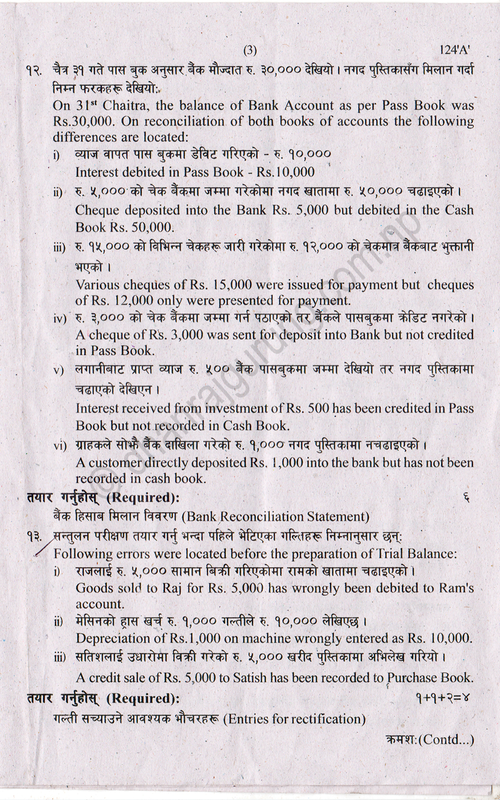 शुरुको शंकास्पद आसामी जगेडा [Opening Provision for bad debts] Rs. 5,000. नउठ्ने आसामी [Bad Debts] Rs. 2,000. 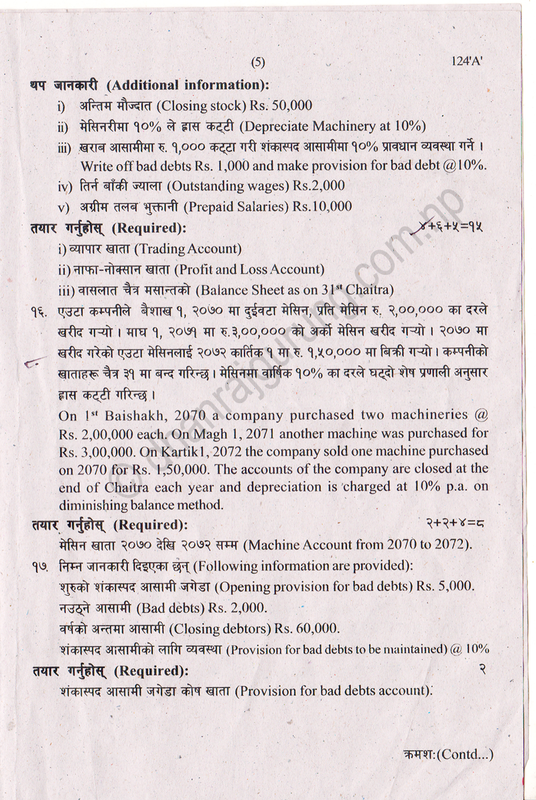 वर्षको अन्तमा आसामी [Closing Debtors] Rs. 60,000. शंकास्पद आसामीको लागि व्यवस्था [Provision for bad debts to be maintained @10%]. 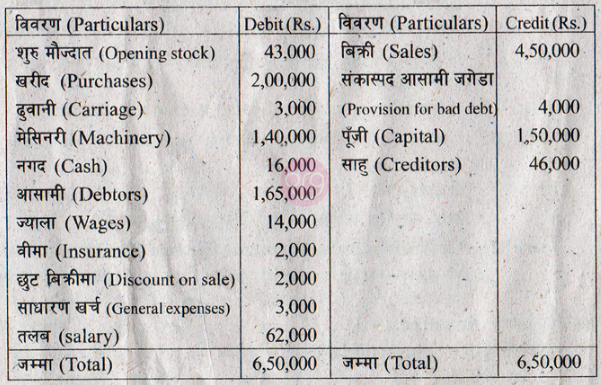 शंकास्पद आसामी जगेडा कोष खाता [Provision for bad debt accounts]. 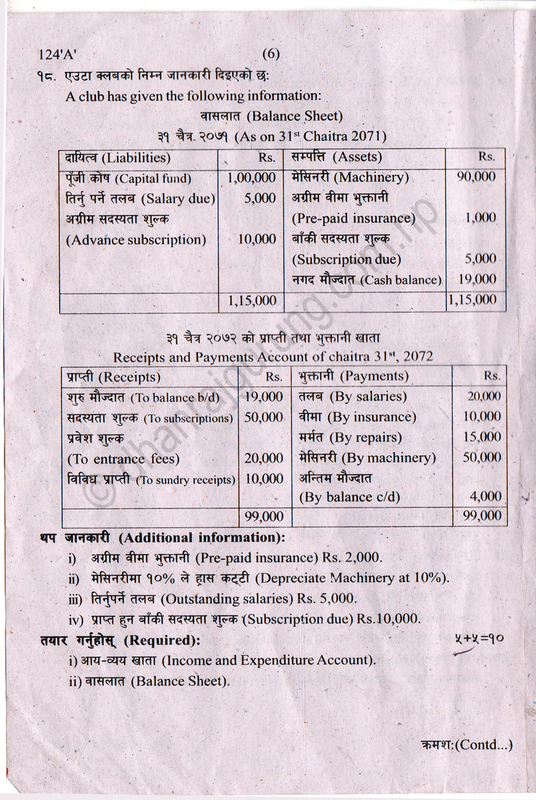 i) अग्रिम वीमा भुक्तानी [Pre-paid insurance] Rs. 2,000.
iii) तिर्नु पर्ने तलब [Outstanding salaries] Rs. 5,000.
iv) प्राप्त हुन बाँकी सदस्य शुल्क [Subscription due] Rs. 10,000.
i) आय-व्यय खाता [Income and Expenditure Account]. वर्ष भरीमा निजी प्रयोजनको लागि रु. १०,००० झिकेको र मेसिनरीमा १०% ले ह्रास कट्टी गरेको छ। [Drawing for domestic use during the years Rs. 10,000 and depreciation on machinery @ 10% p.a. ii) नाफा-नोक्सान विवरण [Statement of Profit and Loss]. Magh 1 : Received budget release and bank order for the actual expenditure of last month Rs. 2,50,000. Magh 5 : Issued a cheque to Mr. Karki for furniture purchase advance of Rs. 40,000. 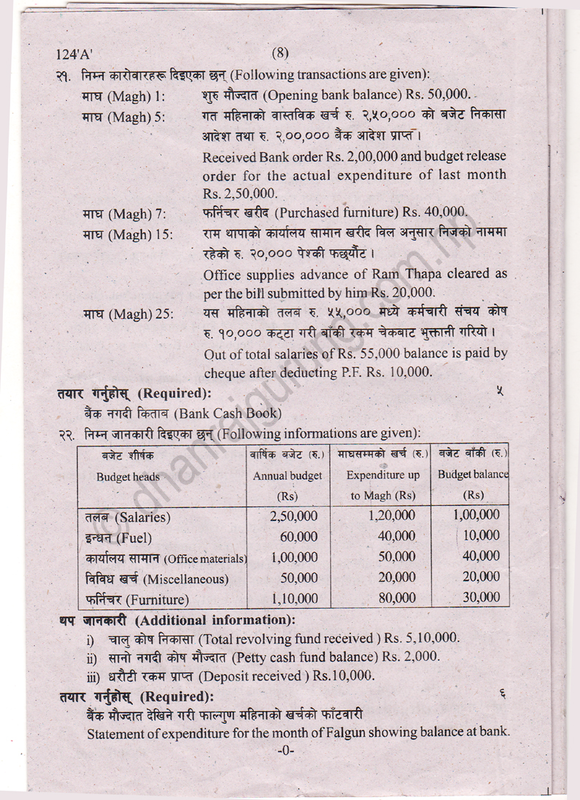 Magh 20 : Petty cash fund of Rs. 5,000 is established in the name of Ramhari. 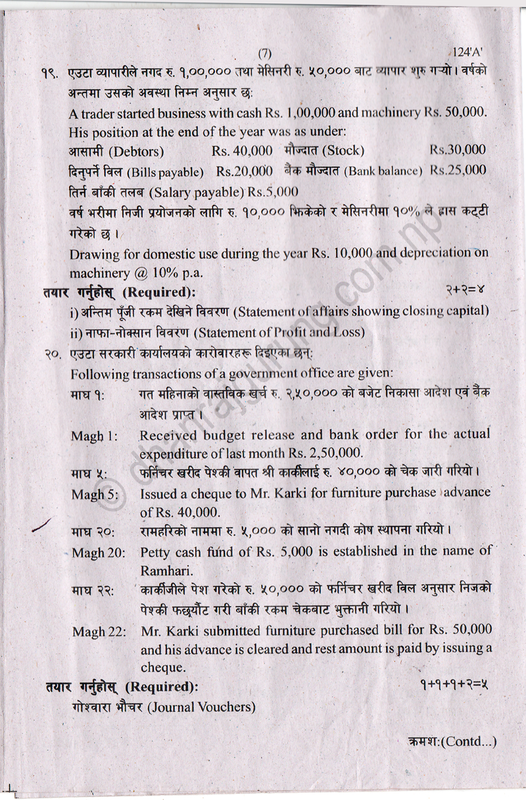 Magh 22 : Mr. Karki submitted furniture purchased bill for 50,000 and his advance is cleared and rest amount is paid by issuing a cheque. माघ [Magh] 1: शुरु मौज्दात [Opening bank balance] Rs. 50,000. माघ [Magh] 5: गत महिनाको वास्तविक खर्च रु. २,५०,००० को बजेट निकासा आदेश तथा रु. २,००,००० बैंक आदेश प्राप्त। [Received Bank order Rs. 2,00,000 and budget release order for the actual expenditure of last month Rs. 2,50,000. माघ [Magh] 7: फर्निचर खरीद [Purchased furniture] Rs. 40,000. माघ [Magh] 15: राम थापाको कार्यालय सामान खरीद विल अनुसार निजको नाममा रहेको रु. २०,००० पेश्की फर्छ्यौट। [Office supplies advance of Ram Thapa cleared as per the bill submitted by him Rs. 20,000. माघ [Magh] 25: यस महिनाको तलब रु. ५५,००० मध्ये कर्मचारी संचय कोष रु. १०,००० कट्टा गरी बाँकी रकम चेकबाट भुक्तानी गरियो। [Out of total salaries of Rs. 55,000 balance is paid by cheque after deducting P.F. Rs. 10,000.
i) चालु कोष निकासा [Total revolving fund received] Rs. 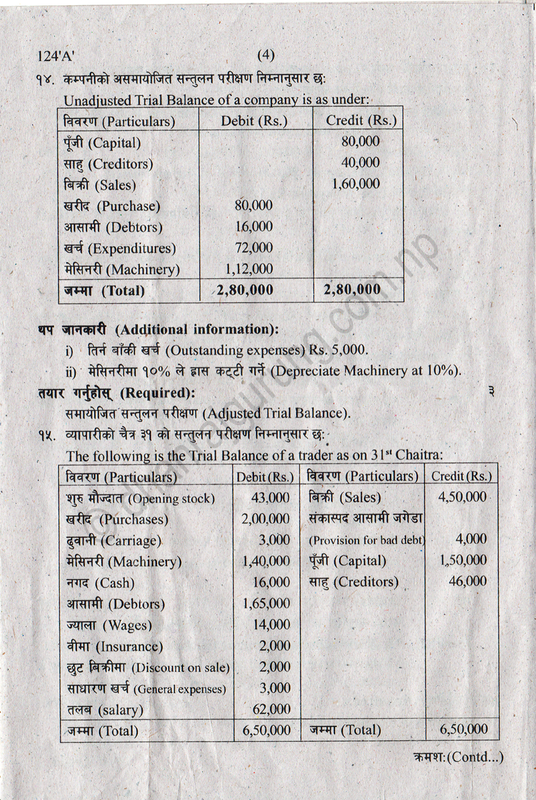 5,10,000.
ii) सानो नगदी कोष मौज्दात [Petty cash fund balance] Rs. 2,000.
iii) धरौटी रकम प्राप्त [Deposit received] Rs. 10,000. बैंक मौज्दात देखिने गरी फाल्गुण महिनाको खर्चको फाँटवारी [Statement of expenditure for the month of Falgun showing balance at bank]. 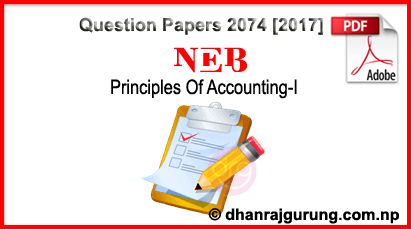 0 Response to "Principles Of Accounting - I | Grade XI | Examination Paper 2074  | National Examinations Board"